Article and images courtesy of article written by blogger Maggie de la V.
Last Wednesday I happened to find myself in the most puzzling, colourful and mysterious exhibition opening of the year. The flyer description set the tone, overloaded with images, colours and self-described by these perplexing questions: What should we wear on the way to the afterlife? Will flamboyance set you free? And will wearing beige really kill you? 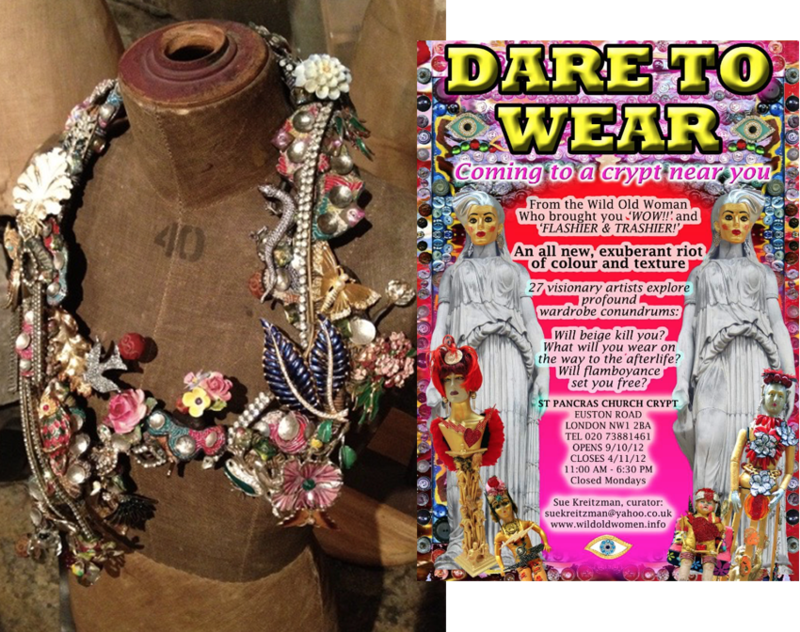 How many kilos of weird jewellery are correct to wear on any given day? Welcome to Dare to Wear! Picture this, you first arrive on the St Pancras Church parking where some lookalike monks will welcome you with a music hard to qualify. The surroundings are dark and some light spots will help you get to the improvised bar where you can nicely enjoy a fresh glass of wine while observing the population surrounding you. The red carpet is filled with queuing onlookers waiting for their turn to penetrate the crypt. 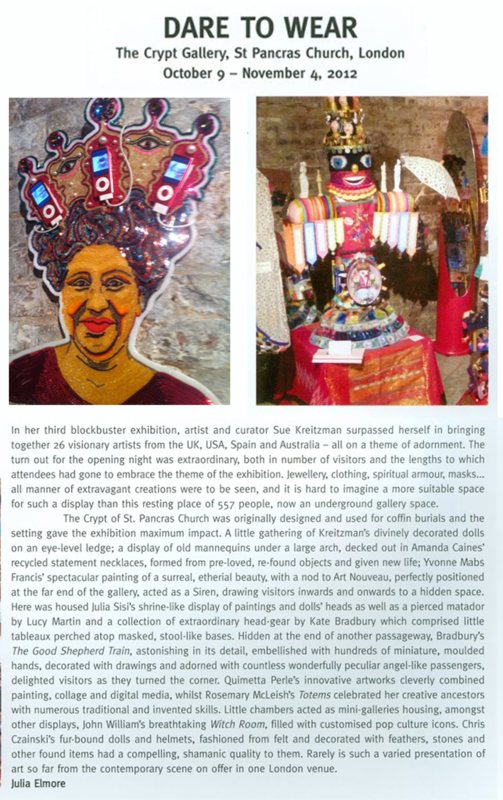 Because, yes, the exhibition takes place in the darkness of St Pancras Church Crypt. While you wait quietly you think you are starting to get what is going to happen inside just by looking at the crowd's outfits. Some might define it as eccentric and it actually is. 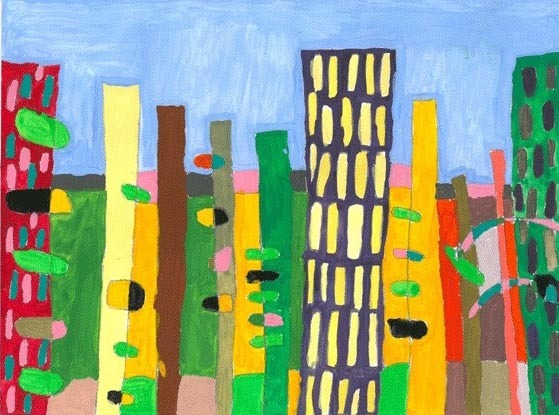 Colourful, original, personal and perfectly in line with the exhibition's name. The explosion of imagery, shapes and colours that you'll find inside is overwhelming. 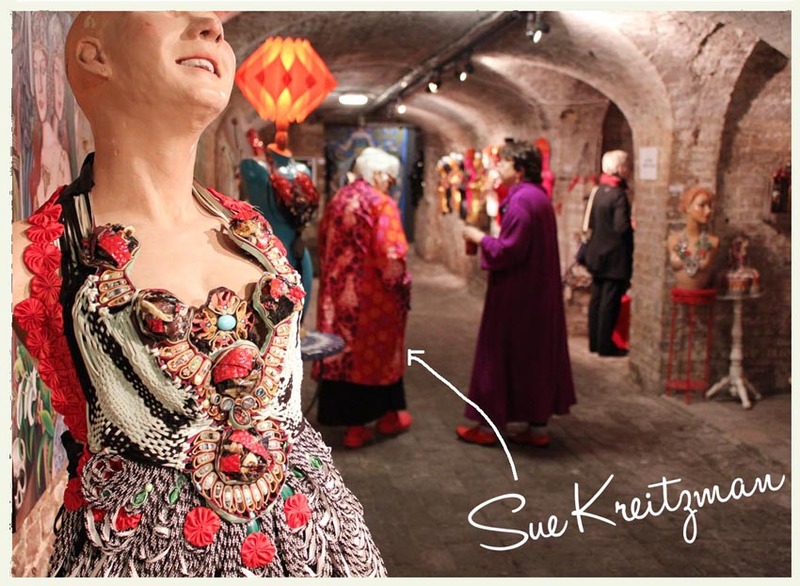 Fashion and art mixed by 27 artists brought together thanks to Sue Kreitzman. 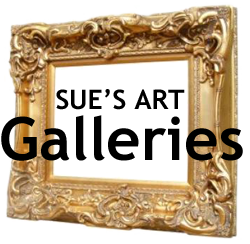 Sue is a very elegant lady who started her career as a successful food writer whom one day woke up in an urge of painting and creating art crafts. The result is something completely raw that feels like it came out of her guts. 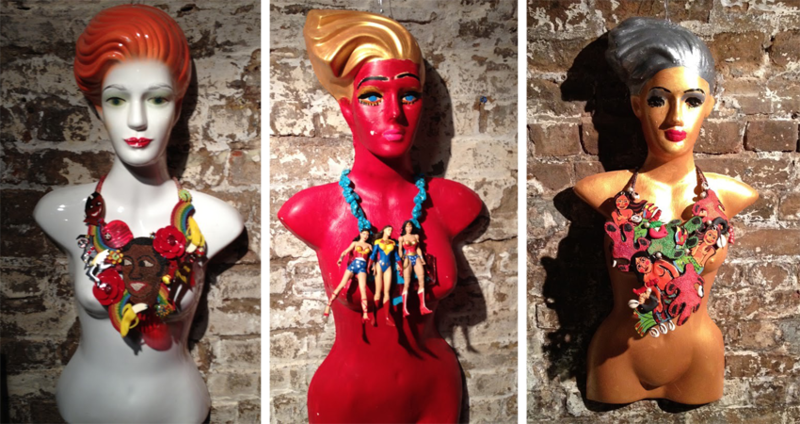 Inspiration may vary between tribal art, religious imagery, old toys and feminine icons (from Frida Kahlo to Medusa). I truly believe that Dare to Wear is mostly trying to convince us about how boring we all look, wearing the same shaped clothes, following the nowadays fashion dictat. 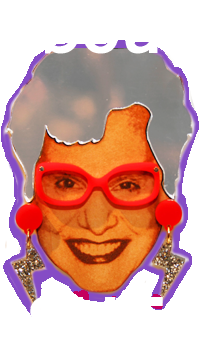 Its purpose is to thumb one's nose at fashion and yell out loud that something else is still possible. The opening offered us a performance by Marnie Scarlett and Mr Pustra. 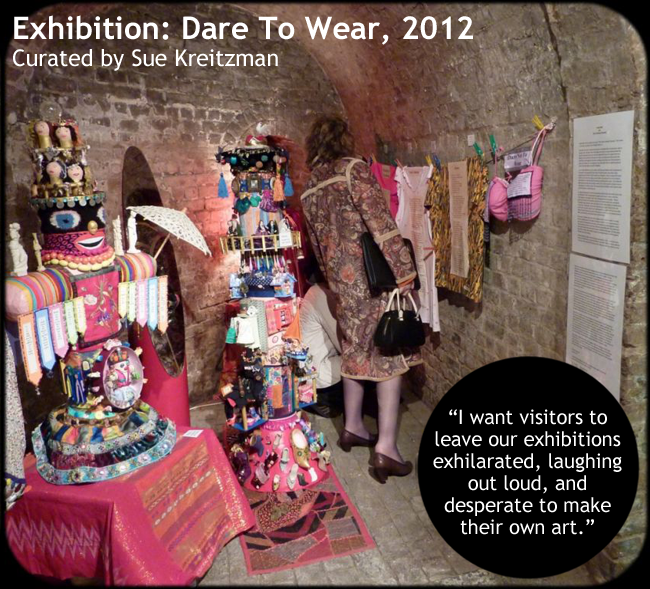 Sue Kreitzman described the show as being the perfect description of Dare to Wear spirit. After being a little puzzled by Mr Pustra and his mirror and by Marnie Scarlett and her green feathers I was wondering what it was all about and I found my answer talking with some of the guests: the performance was the exact representation of a bigger meaning, the simple act of Daring to Exist. 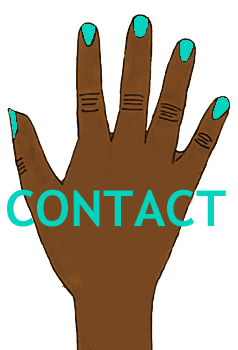 Author: Maggie de la V.
- Provide opportunities for students to work on creative projects with a mental health focus. The first event from Making Mental Health Fashionable brought together a diverse range of participants to explore creative ways in which outsider art, fashion and mental health can collaborate. This event was open to UAL staff, students and the general public. The talks were followed by a panel discussion/Q&A and refreshments.